Visit Manitoga, the House, Studio and Woodland Garden of pioneer industrial designer, Russel Wright (1904-1976). 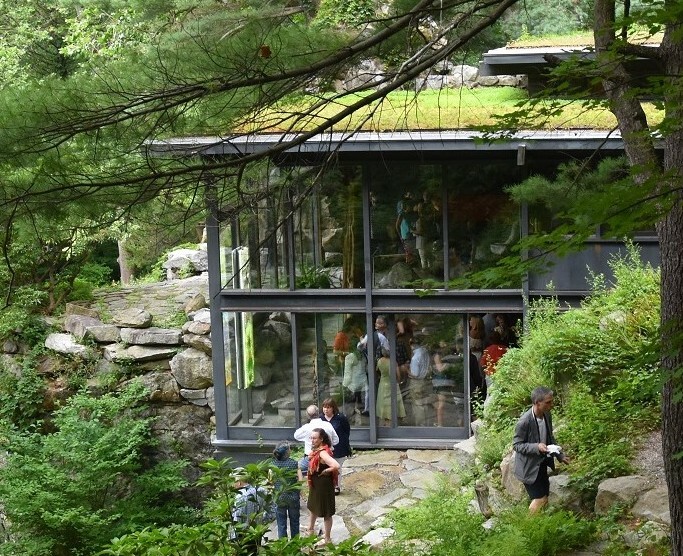 Tour Dragon Rock, Wright’s experimental home which he built onto the rock ledge of an abandoned quarry while masterfully orchestrating the surrounding landscape into a series of outdoor rooms of varying character and delight. Visit Manitoga, the House, Studio and Woodland Garden of pioneer industrial designer, Russel Wright (1904-1976). Tour Dragon Rock, Wright’s experimental home which he built onto the rock ledge of an abandoned quarry while masterfully orchestrating the surrounding landscape into a series of outdoor rooms of varying character and delight. Please note that the landscape portion of the tour is a moderate hike. Also featuring Close Your Physical Eye by acclaimed artist Michele Oka Donor and Gifts from the George R. Kravis II Collection, iconic designs by Russel Wright. Purchase Manitoga tour tickets by clicking on the month below, choosing Metro-North Ticket option ($5 discount with valid train ticket only). Then purchase your train ticket separately at any Metro-North Railroad ticket offices, ticket vending machines, or on the mobile app, MTA e-tix. Show your train ticket at Manitoga's Visitor/Guide House for check-in. Take the Hudson Line train departing Grand Central at 8:32am and arriving Cold Spring station at 9:57 am. The Cold Spring Trolley $2 per ride ($4 round-trip) meets the train at the Cold Spring visitor kiosk for the 11 am tour at Manitoga. Disembark from train on town side, turn left, and follow the platform to the end toward sign for Cold Spring. Do not cross the track to the River side. The Trolley is green and will be waiting near the small brick kiosk only until train departs. 12:30 p.m. return Trolley to Cold Spring from Manitoga. For other tour times and for hiking: Take the train to Garrison Station. Arrange in advance a short taxi ride (845-446-8294) or Uber from the station to Manitoga, 584 Route 9D, Garrison, NY 10524. Call 845-446-8294. PLEASE NOTE: It is not advised to walk from the Garrison Station to Manitoga. If you are unavoidably delayed or will not make the Train/Trolley connection, please call 845-422-2380. Tours begin with a short film about Wright's life and design legacy. Visitors then follow the upper Quarry Path to Dragon Rock. Along the way, the tour features stunning views of the House and Studio, an ascending stone staircase, a field of mountain laurel, and the exquisite moss room. Visitors approach Dragon Rock by crossing the majestic waterfall via a wood plank bridge. Interior spaces are defined by expanses of glass, innovative materials use, and seamless connections to outside terraces. The Tour concludes by following a stepping stone path over the Quarry Pool dam to the Visitor/Guide House. Tours last 90 minutes and are conducted rain or shine. Please wear sensible walking shoes and dress for weather. Visitors must be able to negotiate uneven ground, several bridge crossings with no handrails and a series of 40 stone steps. PLEASE NOTE: Pets, backpacks, large bags, tripods, extension poles and selfie-sticks are not permitted. Ticket purchases are non-refundable once sales close two hours before the tour is scheduled to begin. Refunds need to be requested directly from BrownPaperTickets.com at 1-800-838-3006. Please have your ticket numbers available. After close of sales, Manitoga can assist in rescheduling your tour within the tour season of the calendar year. Our office number is 845-424-3812.